2 The role of Wikipedia in the intellectualisation of the African Languages: Why, what and how? Breaking News! The closing date for the Wiki from Above competition has been extended to 25 May 2015. The focus of this project is to increase the quality and quantity of aerial photographs and video media of important public landmarks and scenery in Africa. Participants are encouraged to also edit Wikipedia by adding their pictures, or media to relevant Wikipedia pages. To view submissions to date, please visit the Commons Category for the competition. The role of Wikipedia in the intellectualisation of the African Languages: Why, what and how? Wikipedia changed the world by putting an encyclopaedia within reach of anybody with internet access. Available in over 280 languages, it grows and improves by the hour and has become one of the most well-known and used resources on the Web. However, in spite of the many languages currently represented in Wikipedia, not all of them have thorough and in-depth content to support multilingual education. Moreover, outside of the realm of a human readable online encyclopaedia in multiple languages, the full value of Wikipedia has remained largely hidden to many readers. Today Wikipedia, for example, also provides a building block for many other advanced technologies, especially language technologies. Through this workshop, the Academy of African Languages and Science (AALS) hopes to play its part in creating an awareness of the significance of Wikipedia as a key educational and language resource through which encyclopaedic information and educational content can be produced and consumed in the African languages. Our hope is that academics, school teachers, language practitioners, subject experts across many domains, students and any other interested persons will recognise and embrace the opportunities that Wikipedia offers for the development of the African languages. Possible ways of contributing are, for example, by translating articles from other Wikipedias, specifically the English one, or by writing new content in the African languages. Since Wikipedia relies on volunteers for its existence, growth and quality, AALS also offers opportunities for training and support for persons interested in getting involved in the building of the African languages Wikipedias in the future. (4) get a glimpse of what it means to be a Wikipedian – examples and lessons learnt. Invited keynote speaker – Amir Aharoni, Wikimedia Foundation. Amir was born in Moscow and now lives in Jerusalem. He received a B.A. from the Hebrew University of Jerusalem in Hebrew language and Structural Linguistics, and began studying for an M.A. in Romance studies in the Hebrew University of Jerusalem. He is a member of the language engineering team of the Wikimedia Foundation, improving the software support for different languages. As a volunteer, he is also a member of Wikimedia Israel and of the Wikimedia Foundation's language committee. Watch the interview with Jimmy and find out more about Wikipedia. One of Wikimedia ZA's projects, Joburgpedia is featured! Did you know that the Afrikaans Wikipedia is 13 years old and holds in excess of 34 000 articles! Learn more about this Wiki in an interview with one of the contributors in Afrikaans on RSG. The 8th Cape Town Wiki Meetup will take place on Saturday, 30 May 2015 from 10:00 to 14:00. This event will be held at the same time and location as the FPV Fest, South Africa's first First Person View drone festival which will be hosted at the Stellenbosch Model Aircraft Academy. Wikimedia ZA has organised a small photographic competition to encourage members of the public, but drone flyers in particular, to submit aerial images to Wikimedia Commons for use on Wikipedia. At this event we will be announcing the winners of the competition. For more information, please visit the meetup website. Joburgpedia is a project aimed at increasing Wikipedia coverage of iconic buildings around Johannesburg with historic and heritage importance. This Saturday, 9 May 2015 we will be launching a Writing Competition in collaboration with our partner, Constitution Hill Education Project. The competition will run from 9 May 2015 to 30 June 2015 and is open to residents of Gauteng, as well as schools who wish to participate as a collaborative input unit. The Annual General Meeting of Wikimedia ZA took place on Saturday, 1 November 2014 and we would like to thank all the members who attended. A copy of the minutes can be viewed online. Please do visit this page to view our achievements, projects and strategy formulations. For the first time WMZA has appointed a member of the Afrikaans speaking community to represent the language. As a Chapter, our aim is to represent all the languages in South Africa, and Afrikaans is a significant part of the editing community. This appointment is the first step to expanding the Afrikaans Wikipedia, and giving the editors / contributors a voice. Congratulations to Douglas on his appointment as President! Membership fees have been established at R 30.00 per annum. Members who wish to pay a lifetime membership fee can do so at a cost of R 300.00. Once we receive your membership fee, you will be allocated a membership number. If you wish to become a member of the Chapter, please e-mail The Administrator for further information. Introducing Wiki From Above - an exciting new competition for aerial photographic and video media to be used on Wikipedia. Wikimedia ZA has joined forces with FPV Fest SA to help encourage people to contribute aerial video and photographic content to Wikimedia Commons for use on Wikipedia. For more information, please visit the competition page, the FPV Fest Website, or listen to an interview on 567 Cape Talk. Competition is open now and ends on 30 April 2015. Please join our Wiki from Above Facebook page for updates on the competition! UCT invites all bilingual English/isiXhosa speakers to participate in a competitive online game to translate South African Wikipedia articles from English into isiXhosa. Participation is entirely voluntary and all identifying information will be kept confidential. There is no financial remuneration for participating. To register for the game please click here to complete the registration form. After registering you can begin translating content and ranking other user translations immediately. You will compete with other participants on translation score and can view your ranking on the leaderboard. Translate and rank more to beat the other participants to the top. The game is not limited to UCT students. Anyone with conversational language skills in both English and isiXhosa may participate. If you have any questions or concerns about this study, please feel free to contact Sean Packham at pcksea001@myuct.ac.za. I am UCT MSc student in the Department of Computer Science being supervised by Prof. Hussein Suleman. This study has been approved by the Faculty of Science Ethics Committee at The University of Cape Town (ref no: FSREC 055–2014). Joburgpedia is a success story that showcases Wikimedia South Africa's efforts to work together with local organisations and government. With the support the City of Johannesburg, the Joburgpedia project was designed to increase exposure of iconic historical sites in the city. Joburgpedia was initially launched as a pilot project, covering twelve strategic sites, with plans to expand next year. Coverage of these sites has seen an increase on Wikipedia articles edited in indigenous languages, particularly in the case of the Gandhi House in Orchards, showing the immense potential this kind of project can have, both in terms of increase coverage of our heritage, but also in providing content in African languages. Modelled on MonmouthpediA the project installed, high quality, durable Quick Response code (QR) tiles next to the blue historical plaques installed by the City of Johannesburg. When a user scans the code with a smartphone, the Wikipedia article related to the heritage site is displayed in the language the phone is set to. Please visit Joburgpedia for more information on the project. This year, the Wiki Loves Monuments competition received a total of 242,344 submissions internationally. 7,498 participants from all over the world took part in the competition and contributed a total of 1,287.9 gigabytes! The winners of the international competition have been announced and the first prize has been awarded to Konstantin Brizhnichenko for a photograph of the Holy Mountains Monastery, Sviatohirsk, Donetsk Oblast, Ukraine. To view all the overall winning photographs, and the top 10 entries from each country, please visit the Wiki Loves Monuments Page on Commons. "We believe that knowledge is a foundation. It is a foundation for human potential, a foundation for freedom, a foundation for opportunity". "Knowledge is powerful. A country or community that has better access to knowledge is more likely to be healthy, more likely to be free, more likely to be happy.Unfortunately, access to knowledge is not equal. In some places, people cannot afford to access it, in others, it is censored or constrained." The Annual Report for the Wikimedia Foundation has been released. Read some of the interesting Wikipedia statistics over the 2013/2014 period. This year 4013 photographs were submitted to Wiki Loves Monuments South Africa. This is a slight decrease from the 6,432 that were submitted last year but we are very happy with what seems to be the much higher quality of this year's submissions. We would like to thank each of the 94 participants that submitted photographs in 2014. If you missed this year's competition or would like to participate again in next year's competition then start taking photographs now to submit in Wiki Loves Monuments 2015 in September 2015. You can view all of the photographs submitted during Wiki Loves Monuments South Africa 2014 on Wikimedia Commons here. You can view all of the photographs submitted globally during 2014 on Wikimedia Commons here. This year a grand total of 242,344 photographs were submitted internationally by 7,498 participants from all over the world totalling 1,287.9 gigabytes of submitted pictures. This is a decrease from last year's 369,589 photographs that were submitted globally in 2013 submitted by 11,943. Have you heard of First Thursdays, an incredible way of experiencing the cultural wealth Cape Town has to offer? 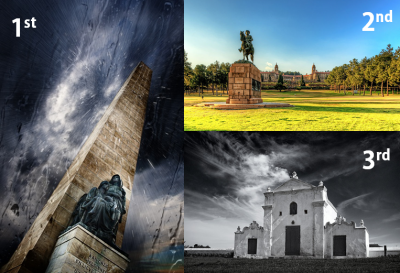 This Thursday, 4 December 2014, entries from the Wiki Loves Monuments 2014 competition will be on display and auctioned to help raise funds for Wikimedia ZA, a not-for-profit organisation representing Wikipedia editors in South Africa. We would love to see you there so please diarise the date and join us! We have pleasure in inviting you to the Wiki Loves Monuments South Africa Award Ceremony, an event where winners of this year’s South African component of the largest photographic competition in the world, will be awarded their prizes. The best photographs submitted from South Africa and around the world will be on display. Refreshments will be served at this semi-formal occasion. Please feel free to forward this invitation on to anyone who you feel might be interested in attending, and you are welcome to bring along a partner. The Open Book edit-a-thon on the 5th September 2014 that took place at the Booklounge bookshop in Cape Town, South Africa. The Open Book Festival Edit-a-Thon, hosted by the Book Lounge (Cape Town) and Wikimedia ZA ran from July to September. A series of events provided an opportunity for the creation of Wikipedia pages for as many South African authors as possible, and to create and improve articles on South African literature. We have compiled a list of Articles to Focus on and Articles that need editing. If you want to get involved in this project, visit any of the pages above or the Open Book Festival page for more information. Our Wikipedian in Residence, Bobby has been very busy at the Johannesburg Heritage Foundation with our project to digitise and upload important historical documents. Let's help Wikipedia by expanding on these articles. A big 'thank you' to everyone who participated in this year's Wiki Loves Monuments! This year 4,013 photographs were submitted by 94 participants totalling 15,078.8 megabytes in South Africa alone. This is a great response and we are very thankful to every participant for contributing their photographs which can now be used to illustrate these monuments on Wikipedia. In terms of activity by number of photographs submitted, South Africa was the 14th most active country participating in Wiki Loves Monuments internationally. This is a great improvement from 17th place in 2013. Now its time for the judges to get to work and select our winners! Internationally a total of 238,678 photographs were submitted by 7,433 participants contributing a total of 969,883.9 megabytes. Dumisani, the Chapter's President, has been appointed as a member of the Funds Dissemination Committee (FDC) for a term beginning on 11 July 2014 and continuing for two years. We wish Dumi every success with his appointment. Wikimania 2014 took place in London from 6 - 10 August 2014. On 5 December 2013 former president and father of the modern South African nation Nelson Rolihlahla Mandela passed away. This sad but deeply important occasion was of global significance and of particular importance to South Africa. In order to properly record this event, Wikimedia ZA decided to send two Wikimedians to cover the event for the greater Wiki-community. On the 9th, 10th and the 11th of December 2013 Wikimedia ZA sent two team members to cover the 10 day mourning period for former president Mandela in Gauteng. Our two Wikimedia correspondents got together in Johannesburg to apply for press cards, and then went on to apply for the media accreditation required to attend proceedings. On the 10th the team attended the memorial held at FNB Stadium in Soweto (Soccer City) along with thousands of others attending the service. Unfortunately only selected media houses were able to capture diplomats and VIP guests, but the team was able to capture many photographs of groups and individuals attending the ceremony. We also made a recording to try and capture the spirit in the stadium. The Wikiteam joined international and local media houses at the Union Buildings in Pretoria to witness the ‘lying in state’ period. However a spokesperson for the presidency advised that only a pre-selected list of media would be granted access to the auditorium where the body was held. We were later granted access with the general public but no cameras or recording devices were allowed. Considering that a pre-determined attendance list was already in place, the team decided it would not be beneficial to cover the proceedings at Qunu. Photographs of these days can be found on Commons in the category: Death and state funeral of Nelson Mandela. Wiki Loves Africa is an annual competition that invites people from across Africa (and beyond) to celebrate the diversity, richness and complexity of this continent we live on. In 2014, the Wiki Loves Africa competition celebrates the theme Cuisine. You can be part of the competition by taking photographs, video or audio that are related to traditional or contemporary local cuisine and entering that media into the competition. The competition will accept any media that is related to the production and consumption of food from across the continent, including the "foods", "dishes", "crops", "husbandry", "culinary art", "cooking methods", "utensils", "food markets", "festivals", "culinary events", "famine food" and any other issues that are related to cuisine on the African continent. Media entered for the competition may be used to illustrate Wikipedia articles relating to the subject, and will become part of the largest free images database in the world, Wikimedia Commons. The competition starts on the 1st October and ends on the 30th November 2014. This page was last modified on 11 June 2015, at 09:53.